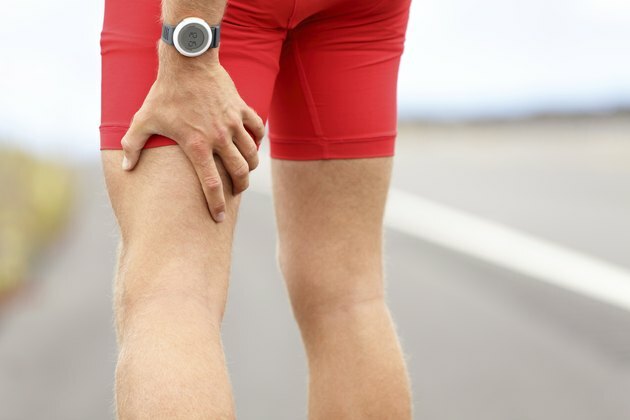 When your outer thigh hurts as you stand after running and after sitting, you may have one of two common conditions. Iliotibial band syndrome is the irritation and inflammation of a large tendon in your thigh. Meralgia paresthetica is a pinched nerve in the thigh. Both can be caused by the overuse of your legs during running. The iliotibial band is a tendon that runs along the outer part of your thigh. It actually starts at the hip, runs vertically down the outside of your leg and then inserts into the knee and the tibia. The iliotibial band keeps your knee stable when you run. It slides back and forth over the bottom of your femur as you flex your knee. When you run a lot, the frequent flexing of your knee can cause the iliotibial band to become irritated, causing pain to the outside of your outer thigh as well as your knee. This irritation can also result if you sit for long periods with your knee bent. To treat iliotibial band syndrome you will first have to rest your knee and ice it to get the swelling and pain to subside. Ice it in 20-minute intervals. You also may need a corticosteroid shot and anti-inflammatory medications. Once your knee is feeling better, begin physical therapy to nurse it back to health. This therapy will focus on stretching the iliotibial band and strengthening the gluteus medius muscle in your hip, which supports the iliotibial band. If treatment fails, you may need surgery to release the iliotibial band where it crosses the knee. Meralgia paresthetica is when a major nerve in your thigh is compressed. The nerve is the lateral femoral cutaneous nerve. It runs along your outer thigh through your groin and pelvis. The repetitive movement of running can cause muscle swelling or pressure, which can squeeze the nerve. Hip injury and weight gain also can cause compression on the nerve. The compression results in meralgia paresthetica, which brings on pain and burning in the outer thigh. Treatment for meralgia paresthetica focuses on relieving pressure to the lateral femoral nerve. Surgery to release the nerve is rare. Usually, you need a corticosteroid injection to reduce swelling as well as a break from the activity that is causing the compression, in this case running, until your leg feels better. If you've gained weight, you may have to lose some pounds to make the pain go away. Otherwise, treatment involves physical therapy to strengthen the muscles in the hip and leg. Why Does My Hip Pop When I Do Sit-Ups?